This book is anti-Clinton. But more so, it's anti-Democrat. And even more so, it's anti-Republican, anti-Washington-DC, and anti-politician. In that context, I would not call this an anti-Hillary book, because that would mean the author, Roger Morris, believes Hillary would be a bad president, and we should vote for someone else. Morris believes, it seems, that the entire system is so corrupt that it's not possible to have a GOOD president, and therefore it hardly matters who we vote for. The book's theme can be summarized as, "All politicians are evil and therefore the Clintons are evil." The book jacket describes Morris as working "in the finest tradition of investigative journalism," but I'd put that more accurately as working "in the worst tradition of cynical journalism." I can't find anything in this book that Morris believes in -- although I can find plenty of what he believes AGAINST. Morris seems to believe that EVERYONE is a bad president -- he bashes Bill Clinton and Ronald Reagan, and then bashes Hillary too. 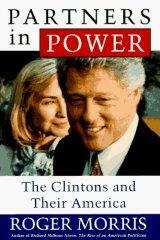 This book was written in 1996, and since it's about Bill and Hillary, they receive most of the bashing. But look, for example, at how Morris describes Washington DC: "Hard beneath Capitol Hill's oily deference and camaraderie was remorseless cannibalism." The book calls itself "a dual biography" of Bill & Hillary Clinton, following their lives chronologically from their childhood homes in Hope AR and Park Ridge IL, to the White House. It's really more of a "triple biography," adding as the third character the American polity, from the Washington political establishment to the press to the Arkansas voters and then finally American society as a whole. The third subject of the biography is described as "a political system gone lethally wrong." Since me and you, dear reader, are members of that American polity, we are implicitly bashed also, which is perhaps why I feel this book is so negative. The book isn't quite a biography (which would include positives as well as negatives), since it is strictly a negative examination, without ever acknowledging positive accomplishments. The book also deals heavily with Ronald Reagan, and a bit with George H. W. Bush Sr., who were presidents during Clinton's governorship. There's a whole chapter on the conspiracy theory of the Mena airport in Arkansas, where (Morris claims) the CIA ran cocaine to fund the Iran-Contra deal, under the explicit approval of Reagan, Bush Sr., and Gov. Clinton. Everyone else the book touches on also gets bashed: from Roger Clinton (Bill's brother, whose drug habits are detailed) to Gerald Ford (who "laid the foundation for the bloated Pentagon budgets of the 1980s.") Even journalists get bashed: "American journalism managed little substantive understanding of or concern for governance and posed no genuine check to the real regime's billowing power," Morris describes the 1990s. So who should read this book? Well, negativists, pessimists, and cynics will just eat this stuff up. Conspiracy theorists will just LOVE the Mena airport chapter. Anti-Hillary people should certainly add this to their repertoire, since Morris explicitly states, for example, that Hillary had an affair with Vince Foster (among numerous other scandals). And who should avoid this book? Anyone who believes, still, that the press has a positive role; that government can change society for the better; or that people at their core are basically good. I put myself firmly in this latter optimistic category, and therefore I found this book to be needlessly pessimistic. In my work with OnTheIssues and elsewhere, I have dealt with hundreds of politicians, some of whom I've supported and many of whom I've opposed. But the one thing in common I've found, among all those politicians, even the ones I worked hard to defeat electorally, is that they all truly believe that they can change their part of the world for the better. I often disagree with HOW they want to change it, but I have never found any politician who's actually in it just for the money, or for the power, or for anything else. Politicians are in politics because they want to do some good. That's why they enter the arena, and put themselves on the line for criticisms like Morris'. And they all deserve a lot more respect than Morris gives them. Bill Clinton: New Democrat from the New South. Bill Clinton: What�s right with America can fix what�s wrong with America. Bill Clinton: Half siblings Henry & Sharron, by two different mothers. Bill Clinton: His father committed bigamy by marrying his mother. Bill Clinton: 1992: opponents failed to find disloyalty in Bill in Moscow. Hillary Clinton: 1969 thesis: Alinsky�s reforms too short term & local. by Roger Morris, published April 1999. Is Bill Clinton an asset for Hillary's 2016 campaign, or a liability? On the asset side, Bill Clinton is widely considered one of the best campaigners in the history of our country, and will certainly help Hillary raise money; get support from key people and organizations; and get voters to turn out to vote for her. On the liability side, Bill Clinton's presidency included (and some would say caused) the polarization of American politics: "before Bill Clinton" means "before Whitewater" but also "before Newt Gingrich and the Contract With America." The high level of political polarization began under Bill Clinton, and persists until today: and the current focus of much of that polarization is Hillary Clinton. Hard Choices, by Hillary Clinton (2014) - her State Dept. memoir. Talking It Over (1998) - her columns while First Lady. A Portrait in Her Own Words, by Claire Osborne (1998) - a collection of speeches and fluff. The Case For Hillary Clinton, by Susan Estrich (2005) - a response to "The Case Against Hillary Clinton" by Peggy Noonan. It Takes a Village, 2006 edition, by Hillary Clinton (1996) - her political philosophy. The Inside Story, by Judith Warner (1993) - her biography as incoming First Lady. A Woman in Charge, by Carl Bernstein (2007) - from the Washington Post. Her Way, by Jeff Gerth & Don Van Natta Jr. (2007) - from the New York Times. Hillary's Choice, by Gail Sheehy (2000) - an investigative biography. The Extreme Makeover of Hillary (Rodham) Clinton, by Bay Buchanan (2007) - a well-written attack book, outlining all of Hillary's trouble spots, by Pat Buchanan's campaign manager. Vast Right-Wing Conspiracy, by Amanda Carpenter (2006) - every possible "Swift-boating" is here. Madame Hillary, by R. Emmett Tyrell (2004) - anti-Hillary from a moderate perspective. What Every American Should Know, by the American Conservative Union (2000) - anti-Hillary during her Senate run.